We’re well into the warmer weather, and hopefully all set to enjoy a beautiful summer. Most of us recognise the importance of hydration, particularly when the weather is hot, and take pains to tell our children to drink more water to stay well. Falls: Dehydration has been shown to be a significant risk factor in falls, which can be disastrous for anyone who is already frail. Constipation: Older people often suffer from constipation as the digestive system works more slowly and being dehydrated can make this much worse. Pressure sores: A lack of fluid in the body can make pressure sores and other skin conditions worse, which is a particular concern for those who are in wheelchairs or bed bound. Confusion: Not drinking enough can lead to dizziness and confusion, which can put older people at risk in all sorts of situations. 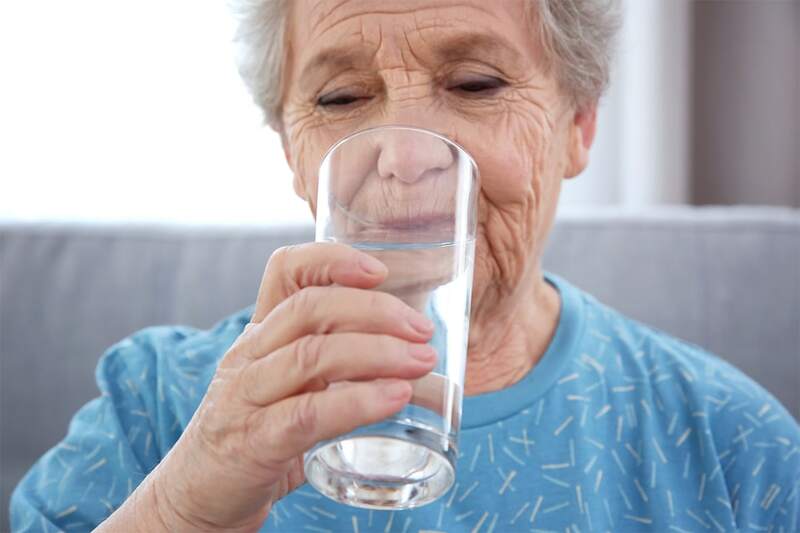 Every year, thousands of older people across the UK end up in hospital because they are dehydrated, often in situations which were completely avoidable. It’s much easier to become dehydrated as an older person, as there is less fluid in the body to start with, around 15 per cent less by age 80 than there was at age 20. However, getting your loved ones to up their intake of fluids is not always particularly easy! Older people can be reluctant to drink for a variety of reasons. As we age, our sense of thirst reduces, so it’s easy to become dehydrated without even realising it. People who have had a stroke or have been diagnosed with dementia may find it even more difficult to recognise when they are thirsty. Problems in the mouth, swallowing pains and particular medications can all add to the risk, and some have been known to deliberately avoid drinks because of incontinence or other personal reasons. Give water with medicines: If your loved one takes tablets, offer a full glass of water with it rather than just a little drop in the bottom of the cup. Make drinks available all day: Have plenty of cold, fresh water close at hand every day. It sounds silly but placing the jug or cup where you’re sure they can reach it will help. Offer alternative means of intake: If your loved one is struggling with coordination or grip, they may be worried about making a mess. Offer a sippy cup, straw or flask instead to overcome this problem. Offer different drinks: Water is the number one drink for avoiding dehydration, but if they’re reluctant to drink water, try juice, squash or warm lemon drinks. Avoid too much tea and coffee: Both tea and coffee are diuretic, which can increase the risk of dehydration. Think about switching to decaf to avoid this problem or trying herbal teas instead. When the weather is hot, you should be aiming to give your loved one around 1.5l per day as a minimum. There are plenty of situations where the intake should be much higher than this, such as being in a hot atmosphere, taking a new medication or on particularly hot days. Keeping this bare minimum in mind will help to stave off the risk of dehydration in your loved one. Here at Chilton House, we work hard to ensure everyone in our home stays hydrated, particularly during the warmer weather. We use all these strategies and more to encourage our residents to drink enough every day. Next time you’re around an elderly friend or relative, remind them to stay hydrated to stay well, and they’ll enjoy looking and feeling much better.